There's more to nights out in Rattanokosin than drinking buckets with sweaty backpackers in tank tops (not that there's anything wrong with that, from time to time). 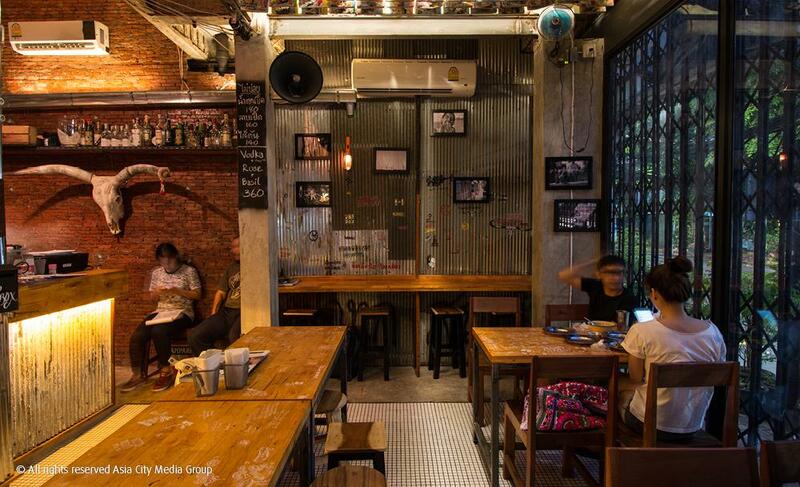 Here are our favorite drinking holes around Khaosan, Phra Athit and Phra Sumen. 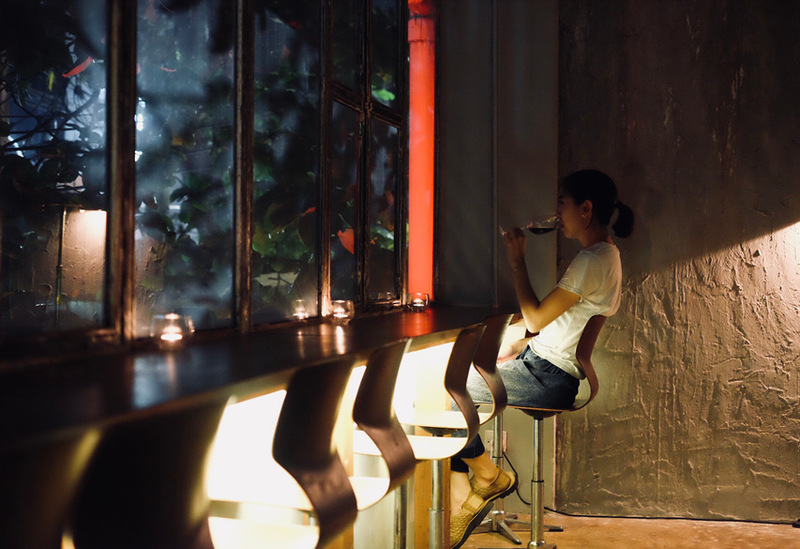 Let your hair down and make like a tourist or simply escape it all at these top places to drink around Khaosan, Phra Athit and Phra Sumen in Bangkok's Old Town. Live Music. 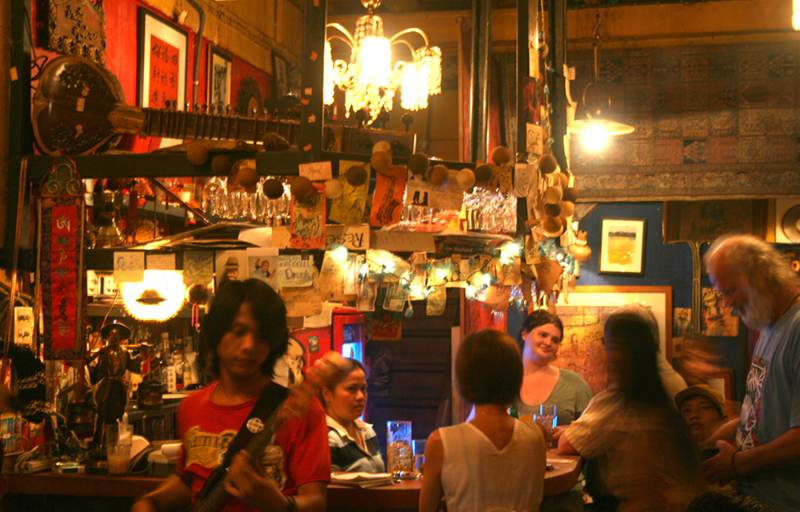 Just around the corner from backpacker-central Khao San Road, this live blues and jazz insitution packs out every night. Indoors can only seat about 20, so you might find yourself perched on the wall outdoors, Singha beer in hand, listening to the loud and energetic music being belted out to a crowd of old-time expats and self-styled local blues-men. 13 Samsen Rd., 089-769-4613. Open daily 6pm-midnight. Riverside. Riva Surya’s restaurant and bar is decked out in contemporary French decor. Visit at sunset for the full deal: comfort food, tasty cocktails and views that take in the river and two bridges (Pinklao and Rama 8). Order up a cocktail like the Jamaican Fizz (vodka, mango fizz, mango, syrup and lime juice) to go with your meal. 23 Phra Athit Rd., 02-633-5000. Open daily 10:30am-10:30pm. Nightclub/Live Music. 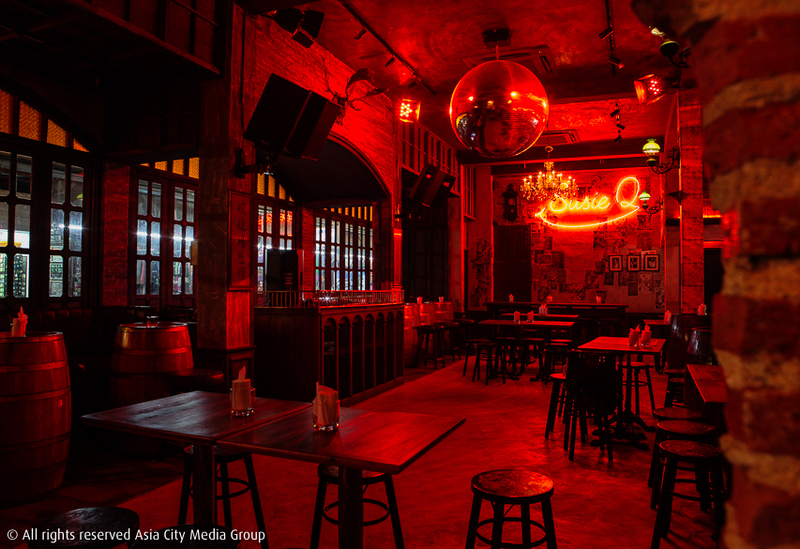 This cavernous Thai-style club is a great place to gather the gang for a long night of live music (from indie to ska) and a bottle of whiskey to share. B300 entrance fees apply on weekend. Buddy Lodge, Khao San Rd., 02-629-4556. Open daily 8pm-2am. Live Music. The Phra Sumen institution offers classic Western comfort food and cocktails, and live performances by quality local jazz bands dominated by finalists of The Voice Thailand like Tissue Paper and Attention Please. Performances run from 8:30pm from Tue-Sun. 469 Phra Sumen Rd., 081-805-7759, Open daily 5pm-1am. Riverside. 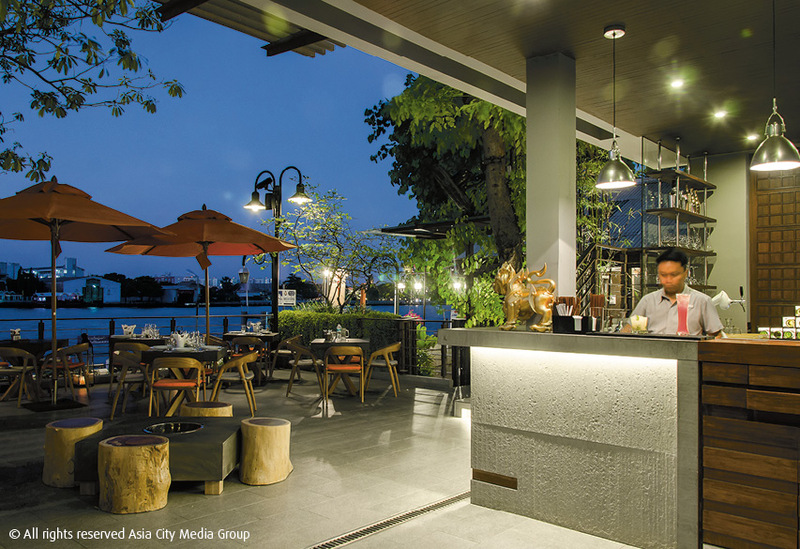 There are many restaurants in Bangkok blessed with the backdrop of the Chao Phraya. Few, however, can boast a spectacle as inspiring as a brightly lit Wat Arun directly across the river from your table like this one. Get the sweet and spicy king river prawn Thai salad with lychee, mint and lemongrass to go with the view. Restaurant-bar. 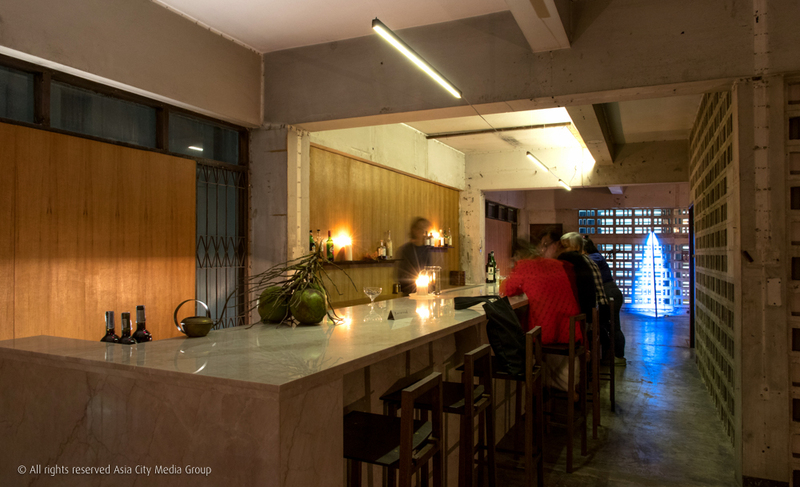 With its hidden location in a small alley off the main Khao San strip, this is a secret spot well worth discovering. Fronted by a stall selling second-hand paperbacks, this former antique home features a canopied outdoor area where young locals share a bottle of whiskey and tourists tackle a beer tower. Inside it’s lots of private nooks and retro furniture. Music-wise, there’s no irritating popsanova, but quality indie tunes and non-commercial hip-hop. The menu sees typical gab glaem consisting of deep-fried nibbles and various yam. 46 Khao San Rd., 081-820-2762, 081-438-4738. Open daily 3pm-1am. Live Music. 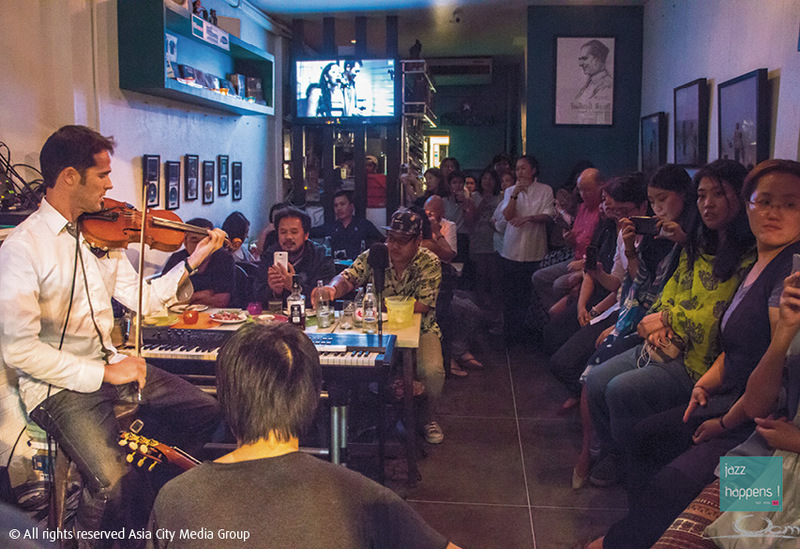 This well-known jazz influenced bar is run by a group of lecturers from the Faculty of Jazz at Silapakorn University with the aim of providing a stage for talented young musicians, including their own students. Apart from live jazz every day, the bar offers classic drinks and a Thai food menu for dinner. 62 Phra Athit Rd., 02-282-9934, 084-450-0505. Open Fri-Wed 5pm-midnight. Wine. This uber-secret bar is tucked below Ku Bar and above Brown Sugar in the Old Town. Dedicated to everything natural wine, the list changes weekly. Though it’s a little bit dark for reading, you can order up a glass (or bottle—why not?) while gazing out the window at the street scene and letting your thoughts run wild. Cocktails. Other bartenders whose opinions we have a lot of time for tell us that nowhere else in Bangkok man-ages to pack such intense flavors into their house infusions than Ku Bar. The results speak for themselves, poured from a meticulously crafted marble and blond-wood bar that playfully contrasts the otherwise stark, concrete space. Restaurant-bar. Karn Liangsrisuk and Chalermpon “Van” Rohitratana, the mixologist and chef duo behind Phra Athit’s divisive burger institution Escapade, put the spotlight on Isaan-inspired food. Deceptively straightforward dishes like larb and fried rice are elevated by an honest dedication to excellent produce and painstaking DIY techniques. This also extends to Karn’s cocktails, which make use of homemade spirits and infusions. Try his twist on an Old Fashioned, which lets Isaan flavors shine in the combo of ox bile (often found in beef laab), Angostura bitters, bourbon, sugar and orange peel. 49 Phra Athit Rd., 081-406-3773. Open Tue-Sun 5-11pm. Riverside. Both locals and expats have flocked to this stylish, so-called “restaurant with guestrooms” to grab a spot on the spacious deck and feast their eyes on the splendid view of Wat Arun (Temple of Dawn) across the river. There’s also a rooftop bar up on the 5/F which is pretty stunning (though it does get windy up there). Sala Rattanakosin Hotel, Maharaj Rd., 02-622-1388. Open daily 7-10:30am, 11am-4:30pm, 5:30-10pm. Riverside/Cocktails. It was a happy day when we discovered that one of Thonglor and Sathorn’s most satisfying Thai restaurants would be branching out to an Old Town riverside location. Here you not only get Supanniga’s wonderful food with prime Wat Arun views, but also their excellent cocktail menu, brimming with well-considered localized classics. Riverside/Beer. Set in what was once an old boathouse right by Phra Arthit Pier, Sheepshank’s themed decor of old pulleys, crates and buoys is topped only by the river views, which are particularly stunning come sundown. The menu charts new American fare, but the list of American craft beers is just as appealing. 47 Phra Athit Rd., 02-629-5165. Open Tue-Thu 5:30pm-midnight; Fri-Sun 5:30pm-1am. Nightclub. The guys behind Blaq Lyte—Thonglor’s sorely missed nightclub and B.A.D. Awards Best New Bar 2017—maintain this venue’s classic ‘60s vibe with a giant disco ball, DJ booth, black and white photographs, red lights aplenty and old wooden seating arrangements. The hip-hop soundtrack is paired with standard pub drinks—without the Thonglor prices. 108, 5-6 Khao San Rd., 02-629-2474. Open daily 7pm-1am.